I’m no audio engineer or healthcare professional, but it sounded logical… except that this theory depended on users’ willingness to lower their volume. And unfortunately, it seems that a new study in the Archives of Internal Medicine suggests that Americans aren’t very willing to do that. 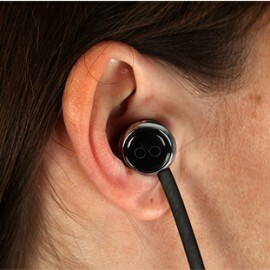 According to the study, there are over 48 million Americans ages 12 and older who have some sort of hearing loss. That’s huge. It means that 1 in 5 people are basically hearing impaired. There are several possible causes, says Dr. Frank R. Lin, lead researcher and assistant professor at Johns Hopkins School of Medicine. These include heredity, aging and environmental factors — including loud music. While we can’t do anything about the first two, we can control the audio we’re exposed to. And if you believe Dr. Lin, we should. Loud noise exposure can cause irreversible, long-term damage, he says, adding that those who are afflicted may not even be aware of it for years. In other words, by the time people find out they’re suffering from hearing loss, it’s too late. No one has been able to pinpoint the precise decibel threshold when safe listening gives way to unhealthy sound levels. But what we do know is that there is a relationship between loudness and length of exposure. Basically, the louder the audio, the faster the damage occurs. The American Academy of Otolaryngology says that listening to tunes at 85dB (decibels) for a while, periodically, would enough to damage your hearing. Turn that up to 100dB, and it would only take 15 minutes to cause hearing loss. Now consider this: The maximum loudness that MP3 players generally produce is 115dB. So here’s a page from the “better safe than sorry files”: Music addicts may want to consider over or around-the-ear headphones instead of in-ear buds. This actually pains me to write this, because I adore in-ear buds, but if you’re prone to forgetting about loud audio, why make it worse by jacking it in right into your ear canal? Either way though, if you care about your hearing, you need to keep the volume down. It’s just like Mom has been saying — if she can hear it with your earbuds/headphones plugged in, it is way too loud.